"John Crowe has been an absolute pleasure to work with. His professional tenacity, his morals, his ethics and his business acumen are far beyond anything we could have hoped to expect. I am not sure we could have gotten through this with anyone else. I am sure he has clients with needs and issues of importance that far outweigh ours but we never knew that and I always felt we were his number one priority." John Crowe has over 20 years of experience as a lawyer. John's clients get the benefit of the rare combination of a best in class transactional attorney who has also litigated in state and federal courtrooms at the trial and appellate levels. Few other lawyers bring such an array of experience from the closing room, courtroom and board room. John functions as the general counsel to many of his clients responding to all of their legal needs when they arise. John regularly advises clients in structuring and negotiating asset and stock transactions for strategic and financial parties; transactions in bankruptcy courts; partnership and investor formations; real estate acquisitions, financing and leasing; business litigation; joint ventures; loan transactions; private placements; franchise relationships; entity formations; supply distribution, marketing and co-development agreements; and employment, consulting and compensation agreements and settlements for executives and salespersons. John has been recognized by his peers and asked to participate as a presenter at seminars focusing on corporate and business law matters, including issues facing owners who are selling their companies, the mergers and acquisitions process, and specialty financings. John is licensed to practice law in the States of New York and Michigan. While in law school, John was the overall winner of the 1996 Albert R. Mugel National Tax Moot Court Competition at which he was also awarded first place for best written legal brief. John also served as a member and as the Business Editor of the Buffalo Law Review. 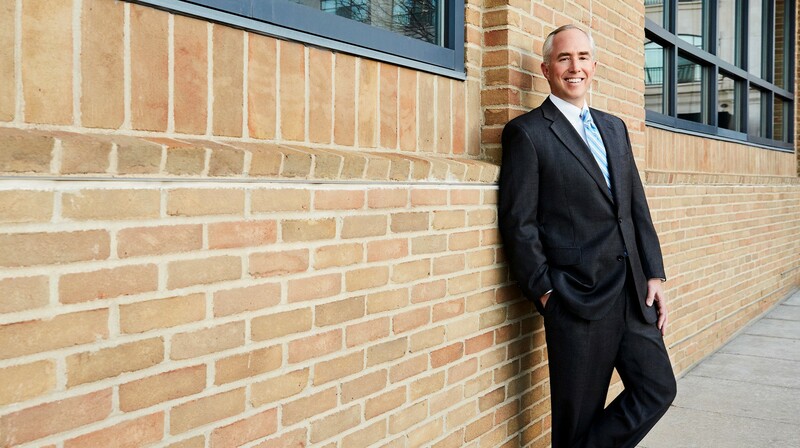 John is involved in several professional organizations and associations including The American Bar Association, the State Bar of Michigan (Member: Corporate, Finance and Business Law Section) and the State Bar of New York. Prior to going to law school, John worked in advertising at a major agency in Chicago. John loves practicing law but admits a telephone call from Notre Dame offering him to become the head football coach might start him thinking of a career change. That telephone call has yet to arrive. Successfully defended fiber and internet service provider against $14M claim brought by the United States involving the American Recovery and Reinvestment Act resulting in favorable settlement of the federal government’s demand for repayment of certain infrastructure improvement grants and loans. Represented investors in the purchaser of the entire Mitsubishi North American Assembly Plant in Normal, Illinois followed by the successful marketing and sale of the entire facility to Rivian Automotive of Livonia Michigan. Represented private owners in the sale of 100% the stock of their commercial and residential landscaping business to a national landscaping company. Represented the defendants in a lawsuit to block the defendants' purchase of an ethanol refining plant through a §363 sale. Defendants were victorious and their purchase upheld at the trial level, and after two succeeding appeals to the U.S. District Court and 7th Circuit Court of Appeals. (Plaintiff's Petition for Writ of Certiorari to the U.S. Supreme Court denied). Represented investors in purchase of warrants and convertible debt of software application company including taking security in the software source and object code. Counsel to Swiss electronics manufacturer in the establishment of its US subsidiary and automotive industry sales office. Represented family owners in the sale of all of their stock in a mortgage software company to an Indian conglomerate. Completed a transaction with the Michigan Economic Development Corporation to make a preferred investment in client's broadband internet service provider company. Represented investors in the purchase of the entire Chrysler Twinsburg, Ohio Stamping Plant from the Chrysler bankruptcy. Represented purchaser in acquisition of the equipment and demolition and scrap rights to a 425 acre steel mill. Represented purchaser in an Article 9 sale for the acquisition of the equipment and demolition and scrap rights to a Washington state paper mill. Represented partners in a partnership dissolution and obtained a court order for performance of a buy sell provision on a summary disposition motion. Represented licensed insurance company in the successful completion of a sale of convertible debt in that company to an international A rated insurance conglomerate. Successfully defended one of the joint owners of real estate in an action for partition including defending the appeal in the Michigan Court of Appeals after winning on summary at state trial court. Represented foreign purchaser in acquisition of California silicon microchip manufacturer including negotiation of supply, technology and R&D agreements with seller's parent company post closing. Represented second generation shareholders, turned employees, in repurchase of large insurance agency from National City Bank (first generation had sold 10 years earlier). Represented Southeast Michigan car dealership in acquisition of a single dealer location, including reassignment of fleet financing from another family. Represented private shareholders in sale of all of their stock in their automated teller machines management company to national cash management service company in Denver. Represented acquirers in the purchaser of all the stock of a lumber distribution and packaging company including follow on acquisitions of two competitors. Represented regional supermarket chain in the purchase of 75 C-store locations, including gas stations. Speaker for Morgan Stanley Smith Barney's "Legal Issues and Concerns When Selling a Business", 2010.